I'm not a drinker, but it wouldn't be a celebration without a little sip of an adult beverage to ring in the New Year. I usually buy a bottle of wine, take one sip, declare it nasty, then pass it over to Jason to finish off. I know, I know. Wine enthusiasts are probably shaking their head in disgust right about now, huh? I just never acquired a taste for alcohol, I suppose. When we hosted Christmas breakfast, my niece insisted that we have mimosas on hand, so I went to Costco to purchase a few bottles of champagne. I have never had a mimosa before, but I'm up for trying anything once. Surprisingly, I found that I actually really liked the champagne/orange juice combination! Since we aren't complete lushes here, I did have an extra bottle of champagne leftover that I needed to figure out what to do with. I knew New Year's was fast approaching, so off I went to Golden Blossom Honey to find a good recipe to put that last bottle to good use. There I found this recipe for Sparkling Champagne Cocktails. What drew me to this recipe was it sounded a lot like the flavor of mimosas. 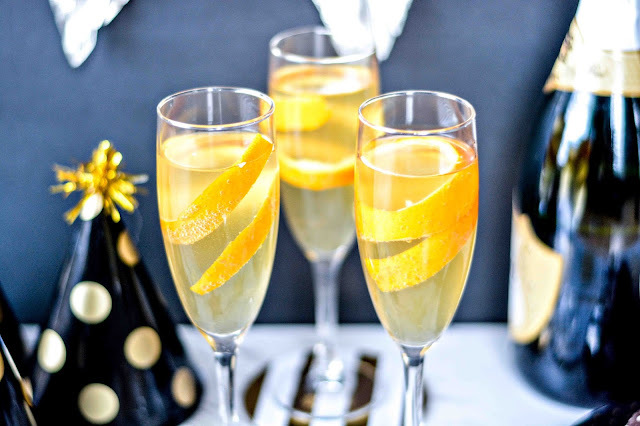 A yummy orange syrup combined with sparkling champagne is just the ticket to a happy new year, indeed! Garnish each glass with a strip of orange peel for an extra classy flare. 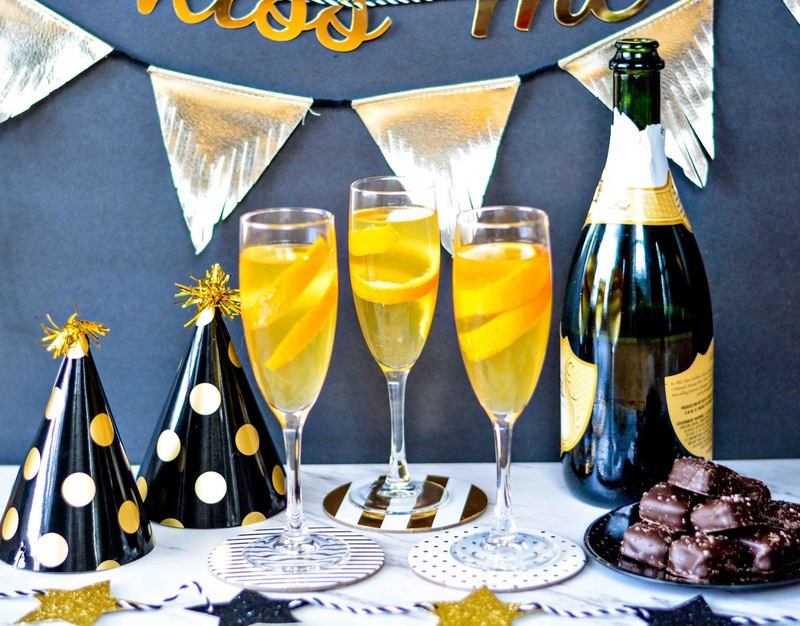 Take a sip of this delicious Sparkling Champagne Cocktails, and make sure to kiss your honey at midnight! Happy New Year to you too, Adam. And Daisy as well! That's a great way to use up that last bottle. Happy New Year! Happy New Year to you and your lovely family, Rosey! While I really don't drink anymore, that sounds delicious. I don't drink either Robert, but I did have a glass of this champagne and it was delicious! These cocktails sound delicious. I would love to try one to ring in the New Year! Happy 2017! I don't get the taste of wine either, it is always nasty to me. Lovely photos, lovely set, lovely combo of colours! Happy New Year tomorrow, I can't believe it is already here! Dahlink, we always try to buy organic fruits and veggies when possible. Thankfully, we now have more organic stores popping up in my area, so it isn't as difficult to find it anymore. I do wish I had my own orange tree. That would be a great perk of moving way down south. Blueberry juice would definitely be a scrumptious option. Strawberries too! yes, that would be a dream, I know people whose families have summer houses down in Dalmatia at the Adriatic sea (it was part of our old country, so many people have condos there, companies and factories even had their resorts there where their workers would go to vacations during summer before the war) and they all have orange, fig and lemon trees in their garden. I just can't imagine having dozens of crates filled with citruses and figs each summer all yours! Just imagine. It is like potatoes here. Sure is a recipe for everything. Good way to use the last bottle indeed. Hope a happy new year is had at your pad! Hope you and the cats have a very happy new year too, Pat! Happy New Year! I'll be ringing in the new year with this recipe. Thanks! That sounds like a yummy way to toast the new year. I believe I'll have to do that with my hubby tomorrow night. Yum! I love a good champagne cocktail. These are so pretty!! I love your set up. 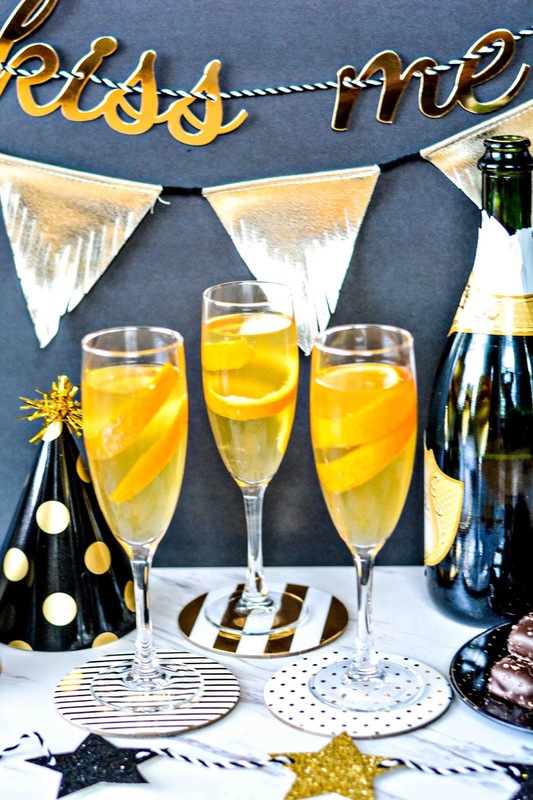 These sparkling champagne cocktails are perfect for new Year p's Eve. Ohh now this sounds like a delicious drink to see in the new year with! I love the ingredients you have used and they look so pretty. You sound exactly like me with wine. Ill taste it and pass it along to my neighbor lol. I do however love to have a sip of champagne on New Year's and mimosas is something i will drink here and there. This looks like a great drink that will taste like a mimosa. Happy New Year Theresa to you and your family. Looking forward to seeing you in 2017! Cheers!! I had never heard of using champagne in a cocktail recipe! I think I will try this tonight instead of just sipping the usual glass of champagne. Yummy - this looks like a good way to go for the holiday. I like the idea of preparing a syrup first. I had to laugh pretty hard at your wine thing. I hate wine as well, not sure how people are so obsessed with it. Now, that's a drink I'd be intetested in! This drink looks so yummy! Happy New Year! We bought alcohol. A lot of it wasn't drank. I don't know what to do with it all. I just can't drink very much anymore. It doesn't work out for me with all my allergies. Maybe I'll just make loaves of beer bead. Ha! Happy New Year! I LOVE mimosas, and will be trying that recipe for sure. Although, it will probably be next time we have company - we don't drink often either, but it's nice to have a fun, fancy drink with guests. For our New Years drink this year, we took one bottle of sparkling white wine, mixed with one bottle of ginger ale, and partially defrosted frozen strawberries mixed in with it. Sooo good!! Happy New Year! That does sound like a delicious sparkling wine drink. I bet the strawberries gave it a nice, sweet flavor. My husband brought home a bottle of Cinnamon Sugar Vodka that I had to try. It was pretty yummy, but since I don't drink, I wasn't doing so hot after 1/2 of a shot haha. However, I'm keeping it in the freezer for the nights I can't sleep because I was so ready for bed once it kicked in! Oooh yum - that sounds good! I can't do shots...it's been maaaaany years, and then over Thanksgiving weekend my husband and our best friends thought it would be fun to do lemon drops - vodka shots followed by sugar coated lemons. Well...mine ended up doing a round trip. LOL - gave everyone a good laugh as I choked and teared up...but it was pretty funny. I won't do a repeat anytime soon, though. Have fabulous 2017 and all the best, Theresa!